With the warm weather here and the trees and flowers in bloom, there's wasn't a better time to have the opportunity to read Devotions from the Garden: Finding Peace and Rest from Your Hurried Life. Come to the garden alone, and fill your soul with His presence. There's nothing on earth like the peace and loveliness of a magnificent garden. It's the place where Adam and Eve first fellowshipped with God, and where you, too, can escape from this chaotic world into His loving arms of beauty and serenity. Devotions from the Garden takes you to that place where senses are restored as dewdrops settle and butterflies gather to witness the miracles of God's creation bloom and grow. Miriam Drennan is the author of Devotions for the Beach and the Days You Wish You Were There and Soar Above the Madness: Surviving Office Politics Without Losing Your Mind, Your Job, or Your Lunch. She currently lives in Nashville, Tennessee, where she enjoys gardening and playing with words. Drop her a line at www.that-writer.com. The book, itself, is a hardcover full of gorgeous photographs of flowers, fruit, greenery, etc. Just looking at the imagery, alone, can really help bring you in tune with nature. There are ninety separate devotions in this book. Each devotion is entitled with some type of gardening theme, such as Perennials, Ladybugs, Drought, and even Composting. When you actually start to read each section, you really do feel a sense of serenity and begin to appreciate the many comparisons between our lives and the natural elements of a garden. Devotions from the Garden isn’t set up in such a way that there is a structured schedule like you may find with other devotionals. You can simply read one devotion a day, or choose to read many at a time. When I started reading the book, I actually had a difficult time putting it down. Each message was so inspirational; I craved to go on to the next, so I would read through many each day. As I read on, it gave me a real feeling of peace, warmth, and closeness to God. Each devotion starts out with a bible verse that corresponds with the subject, followed by a page or two that compares an aspect of gardening with our own lives. At the end of every devotion, there’s also a small personal prayer that you can recite. Ask the LORD for rain in the springtime; it is the LORD who sends the thunderstorms. He gives showers of rain to all people, and plants of the field to everyone. The next section will then go on to discuss how beneficial a rain shower is for any garden. We as humans may not appreciate the rain as much, because perhaps it may interfere with our initial plans for the day, but sometimes a little rain in our lives is necessary. Just as rain is vital in order to help a garden grow, so it is the case for us. There may be times when we feel as though we have a cloud looming over our head or are being tested in some way. Situations such as this can help bring us closer to God, drenching us in his spirit, and ultimately allowing us to grow. Lord, I ask for opportunities to grow closer to You. Should they come in the form of a rainy day…Help me to understand that rainy days are just as essential as sunny ones in my growth in You. Although, I personally enjoy gardening, you really don’t have to be an avid gardener to actually appreciate this book. While it uses analogies related to gardening, the messages have a deeper meaning that reminds us of the many ways in which you can lead a fulfilling life with the Lord. 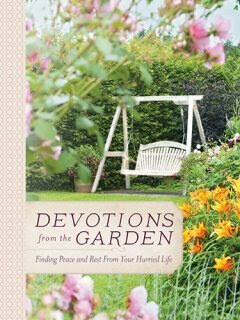 If you're interested in purchasing Devotions from the Garden: Finding Peace and Rest in Your Busy Life, you can find it on Amazon. It's a wonderful additional to have in your library, and it also makes a beautiful gift for any garden lover in your life.